johan & nyström T-Te Earl Gay ekologic honeybush in loose weight is a tea beyond all definitions of what such should be and contain; a wild and beautiful blend of honeybush, white and black tea flavored with blueberry, bergamot and rainbows. Drink it with or without sugar and milk. Drink it tonight or for the rest of your life. Drink it from a cup, out of a shoe, or directly from the teapot. It's your tea. How you love it only you can decide. All tastes have varying appearance on the four sides of the canister, consisting of different letters and symbols. The different sides allow for creative and personal combinations on the kitchen shelf. The minimalistic Swedish design on the sides of the can be supplemented with the above texts on the cover. 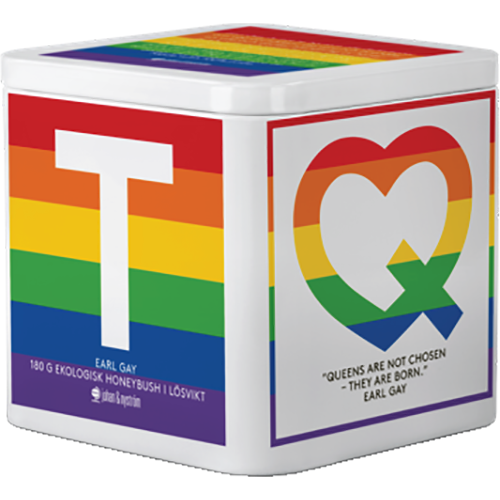 5 SEK per can go to the Regnbagsfonden (Rainbow Fund).